The 2014 Southern California Tionól will take place over Halloween weekend, October 31 to November 2, 2014. 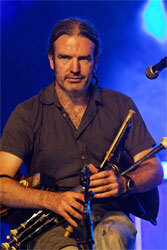 Our guests this year is Lúnasa piper and whistler Cillian Vallely. Local lad Patrick D'Arcy will also be there to tame the stragglers. At the reedmaking table we're delighted to welcome our own local reed maestro Michael O'Donovan to offer moral support to one and all. This years classes and party are back in the home of Gabriel McKeagney. The concert will be held in the beautiful Spanish Mission town of San Juan Capistrano's Library. You will be familiar with this location from our Tionól with Robbie Hannan. Beginner Bootcamp & Private Lessons Lunch Classes Master Class Q&A with Cillian Dinner Concert Session & Party. Please BYOB! Starting at age 7, Cillian Vallely learned the whistle and uilleann pipes from his parents Brian and Eithne at the Armagh Pipers Club, a group that for over 4 decades has fostered the revival of traditional music in the north of Ireland. Since leaving college, he has played professionally and has toured all over North America and Europe in addition to Japan, Hong Kong, New Zealand and Australia. Since 1999, he has been a member of the band "Lunasa", with whom he has recorded 6 albums and played at many major festivals including Womad, Glastonbury, Edmonton & Winnipeg Folk Festivals, Lorient Interceltique and The Hollywood Bowl. He has also performed and toured with "Riverdance", Natalie Merchant, Tim O Brien & Mary Chapin-Carpenter in "The Crossing", New York-based "Whirligig", and the "Celtic Jazz Collective" with Lewis Nash and Peter Washington. In the past couple of years, he has worked on various collaborations between traditional and classical music, along with his brother Niall and the composer Micheal O'Suilleabhain. 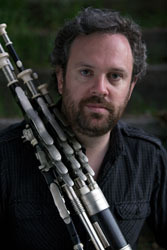 He has recorded on over 40 albums including "Callan Bridge" with his brother Niall, "On Common Ground" with Kevin Crawford and various guest spots with Natalie Merchant, Alan Simon's "Excalibur" project with Fairport Convention and Moody Blues, "GAIA" with the Prague Philharmonic Orchestra, and Karan Casey. He has recently recorded on two movie soundtracks, "Irish Jam" and "The Golden Boys" and played uilleann pipes on the BBC's "Flight of the Earls" soundtrack.